Brecknock has been awarded Rights Respecting School GOLD status, which is the highest stage of the Rights Respecting Schools Award (after Bronze: Rights Committed and Silver: Rights Aware). It is granted by Unicef UK to schools that have fully embedded children’s rights throughout the school in its policies, practice and ethos, as outlined in the three RRSA Strands (click here for more information). Click here to read the school’s report in full. At Brecknock, we are committed to placing the values and principles of the Convention on the Rights of the Child at the heart of our policies and practice. It is important to us that children recognise their rights but also acknowledge the rights of others. Understanding that link is at the heart of our school ethos. As well as this approach shaping the needs of our own pupils and creating a Rights Respecting community, we aim to use this shared understanding to work for global justice and sustainable living. Children from every class apply to become ambassadors. They apply to the headteacher, in writing, giving their reasons. Each ambassador selected serves at least 2 years in their post. They meet at least twice a term, often more, depending on their current project. We place great emphasis on debate at Brecknock, and hold formal debates twice each year. These debates are often based on Values, and our ambassadors agree the motions. Children learn to use the formal language of debate, and how to present a convincing argument from both sides. You can see these debates on our Rights Respecting pages of the website. We also integrate the Rights of the Child into our topic teaching so that children are aware of how children’s rights are and were respected and/or neglected in history and across the world today. We want our children to develop the confidence, through their experience of an inclusive rights-respecting school community, to play an active role in their own learning and to speak and act for the rights of all to be respected locally and globally. We are keen to enlist the help of local councillors, politicians and lawyers to teach the children about their rights and responsibilities as citizens – and we visit the Houses of Parliament! Being a Rights Respecting School also shapes our behaviour management. Every class draws up a class charter based on agreed rights, for example Article 12, “respect for the views of the child”, and then lists how adults and children will respect this right. We emphasise the ethos that rights, are linked with responsibility. Now that behavior is understood in this way, there is less need for rules and sanctions. The children from Year 2 to Year 6 are invited to apply for the posts of a ‘Rights Respecting School Ambassador’. The children are invited to submit written applications for the posts, making it clear what they feel they could bring to the post and what they see their role within school and the wider community being. The Ambassadors meet regularly to discuss ideas and projects and to support the school community in the Rights Respecting Work. Our current Ambassadors are shown below, along with a short film from a presentation they recently made to parents and teachers from other London schools on their work. 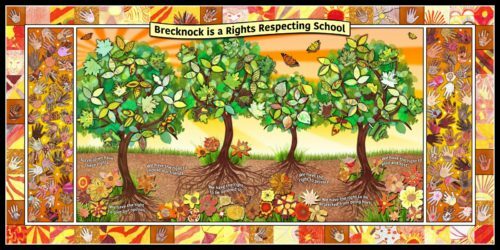 At Brecknock, we have rights, and believe that with these rights come responsibilities. We know that respecting ourselves, each other and everyone in our school community, is our first step towards acknowledging the importance of rights and responsibilities of all people, everywhere. We have the right to be educated. We have a responsibility to work hard, try our best and be encouraging to others. We have the right to learn in a happy and stimulating environment. We have the responsibility to take care of our school environment and everyone and everything in it. We have the responsibility to behave in a way that keeps others safe. We have the right to fair treatment. We have the right to express an opinion and have our thoughts, ideas and beliefs considered. We have the responsibility to listen to, and respect the opinions and beliefs of others. We believe that we should stand up for the rights of others as well as for ourselves.